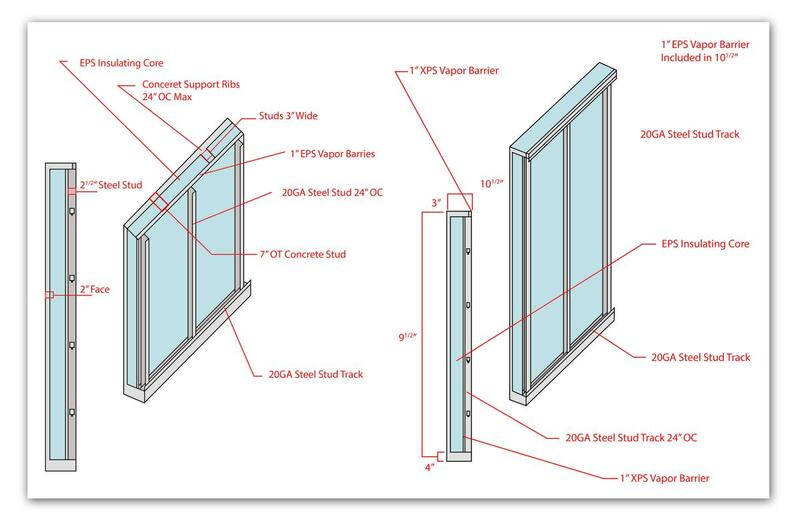 Our standard insulated concrete wall is installed in one day (typically), has an insulation value of R-22, an attractive broom-finished concrete exterior, and is ready-to-finish with steel studs on the interior face of the wall. The wall thickness is 10 ½” and consists of minimum 5,000 PSI fiber-reinforced concrete, EPS rigid insulation, rebar, and commercial grade steel studs. We hand-build forms to create window and door openings, beam pockets, and support and veneer ledges into our walls at our factory and we are able to customize wall heights, intersecting angles, and create gables and other configurations to meet your specific needs. We have custom capabilities you will not find elsewhere. Our insulated concrete wall system is a green and sustainable building product. Noteworthy advantages include a lifetime of energy savings, low maintenance, exceptionally long useful life, less construction waste added to landfills, and made with materials that are locally purchased. Our walls help achieve green standards certified by LEED, PHIUS, Energy Star, and EarthCraft. Our standard wall heights are 8’-2 1/2”, 9’-2 1/2”, 10’-0”, and 12’-0” however we are able to modify these heights as needed. Suitable for any basement – entirely below-grade, walk-out, or partial walk-out - our walls are carefully positioned with a crane and our experienced installation crew on a bed of clean crushed gravel. Installed on a properly prepared site, our walls will provide you with a dry basement and a rock-solid foundation for your home – for your lifetime. Single Family, Single story, Multi-story, Condominium, Slab on grade, Full or Partial Basement, Modern, Traditional, Contemporary, Craftsman, Vacation, Farmhouse, Cottage – we’ve designed and built walls for them all. Our standard R-22 walls can be modified to achieve significantly higher R-Value and energy performance. Bring us your plans – we are eager to demonstrate our innovative design solutions to building with insulated concrete walls. Retail facilities, government buildings, schools, convenience stores, fast food operations - the features and benefits or our insulated concrete walls apply equally well to light commercial projects.